Are your employees not reading company emails? Are your employees not retaining important information from their training? 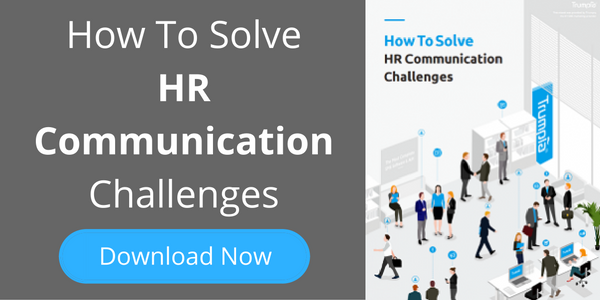 Do a large number of your employees miss out on corporate events, HR deadlines or other company functions, despite your sending “communications” to them? If you said yes to any of these problems, then you will want to keep reading. In this blog, we will cover unique and innovative ways to communicate with employees that will increase employee engagement. We will start by covering the message. Later we will discuss SMS as a delivery method for your communications and why it is a great platform. Make sure that your message or call-to-action resonates with your audience. Is it clear and concise? It sounds simple, but it can be difficult to execute, so here are a few tips. Eliminate any potential ambiguity and streamline it so that it is easy to read and understand. Once you have it honed, test the message with a few people in your audience. Listen to their feedback – it is almost always invaluable. Also, don’t overload the message with content, you can always link or refer to more detailed information. Get the marketing department to look it over. If you don’t have one, consider hiring Houston marketing firm IMPROZ because they are great. Will your employees find the information useful? Will they react in a manner that you are intending? Often, messages need to plainly spell out what the benefit of reading the content will provide the reader. Communications regarding new changes in employee benefits, corporate policy or changes in HR should always be crafted from the point of view of what benefit does the change or topic have for the employee. Never assume that an employee can infer a benefit – always tell them! Now that we have covered two key aspects of crafting your message, we will discuss a delivery method that has become a leading platform – SMS or text messaging. Comedians say “it’s all in the delivery” and that is true with corporate messaging and communications too. A joke delivered correctly can elicit huge laughter that fills a room, but that same joke told flat can leave the room silent. The “delivery” is all about timing and emphasizing some aspect of the joke. And when it comes to effective delivery of information, almost no other platform can compete with SMS. SMS should be a key communication delivery method for corporations to connect, inform, educate and engage with their employees. SMS is a powerful yet simple tool for any company to communicate with its employees. SMS is literally in everyone’s pocket. Marketers and communicators want to be everywhere their audience is, and no other platform provides the coverage that SMS does. Every smart device – phone or tablet – today can accept them. And for the tech-resistant, even old style cell phones can accept SMS messages. If an employee doesn’t have the latest iPhone or Android, but they have an “old-school” flip phone, they will still be able to receive your message. In short, SMS’ ability to connect far surpasses that of email or other web-based communication platforms. For corporations with a large number of employees in retail or remote environments, using SMS can help increase messages penetration since staff in these setting have limited access to computers or by the nature of the positions do not have a computer directly in front of them. SMS has highest and fastest response rates of nearly any communication platform. Use Tiny URLS to invite employees to complete surveys. And that is just the start. There are endless ways to use SMS to maximize the impact and response to your messaging. That includes incorporating it into your web design. There are certainly ways to use SMS as a marketing strategy. Get creative and use these tip as inspiration or as a guide. Please, be sure to join in the conversation. We would love to hear your ideas, experiences or your questions. Leave your comments below.